After her mother is shot at a checkpoint, fifteen-year-old Sarah meets a mysterious man with an ambiguous accent, a suspiciously bare apartment, and a lockbox full of weapons. He’s part of the secret resistance against the Third Reich, and he needs Sarah to hide in plain sight at a school for the daughters of top Nazi brass, posing as one of them. If she can befriend the daughter of a key scientist and get invited to her house, she might be able to steal the blueprints to a bomb that could destroy the cities of Western Europe. I had already posted my stack the previous day. One of my favorite things is scrolling through all the other photos of stacks. It’s not only fun to see what everyone else is reading, but it’s a great way to find new books to read. 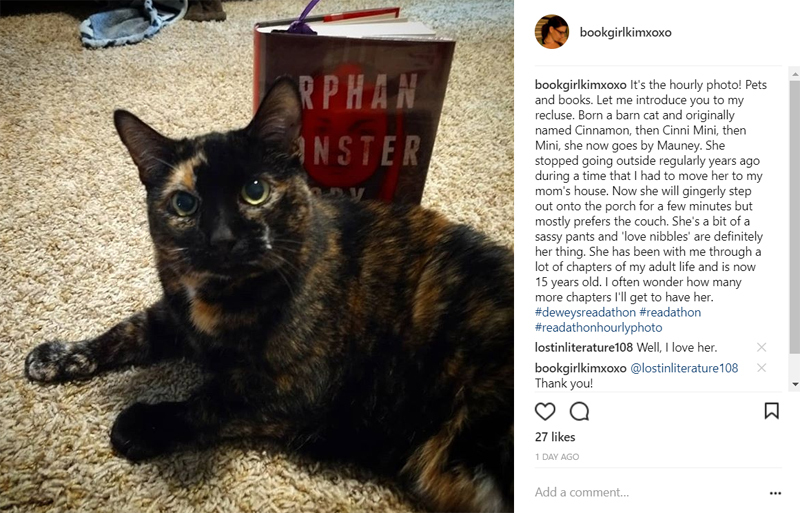 7:00 am – I noticed that the readathon Instagram prompt for that hour was books and pets so I quickly snapped a photo of the kitty closest to me and posted a little blurb about her. I realized I wouldn’t be able to keep up with the hourly photos but it was fun to sneak that one in. 8:00 am – Nearly every weekend we go out to breakfast as a family and this weekend we ended up at Einstein’s for bagels. I brought my audiobook copy of Orphan Monster Spy along to listen. I was starting to really get in to it. When we got back home I continued to listen to my audiobook as much as I could while doing chores around the house and tending to the kiddos. I also periodically checked in to Instagram to see how everyone else was doing. 12:00 pm – Lunch! 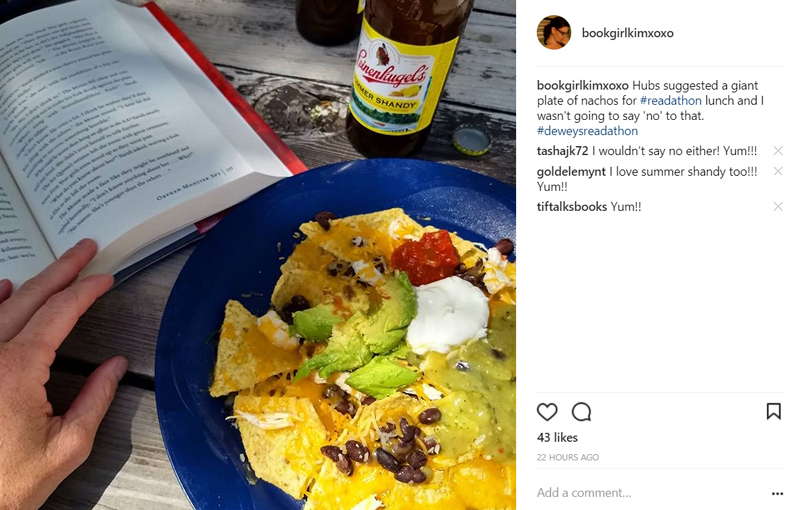 I made a giant plate of nachos and went to sit and read on the picnic table. I photographed the physical copy of my book for Instagram purposes but I was still listening to my audiobook on double speed. After lunch things got crazy and I had to leave the readathon for several hours in favor of mom duties. Wealthy Richard Walker has just died, leaving behind his country house full of rooms packed with the detritus of a lifetime. His estranged family—bitter ex-wife Caroline, troubled teenage son Trenton, and unforgiving daughter Minna—have arrived for their inheritance. But the Walkers are not alone. Prim Alice and the cynical Sandra, long dead former residents bound to the house, linger within its claustrophobic walls. I was only a few chapters in when I realized this book may not be for me. I read to the halfway point when I got back home and then set it aside. Already at the halfway point with that book and knowing it was fairly short, I was eager to just finish it up. I didn’t quite finish but I’m close. I helped my husband get the boys in bed a couple hours later and then left for my night out. I knew I probably wouldn’t read any more that night and I was right. 11:30 pm – Back home and exhausted. 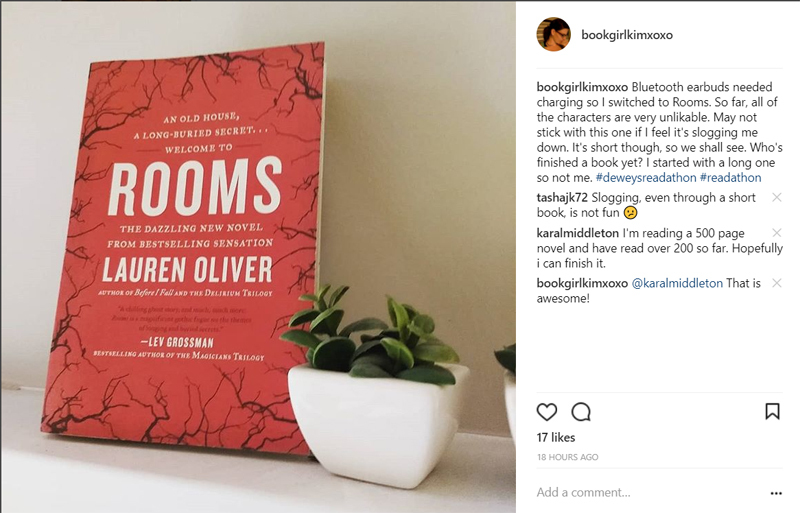 One last check with the Instagram community and I crashed knowing I’d be up multiple times with the baby and it was time to hang up my readathon hat. Man, I’ll be really excited when the whole family can participate with me. Or at least, when I get back to a point where I can lounge all day and just eat snacks and read. All in all I got half way through two books and nearly finished the third. Not bad for me, I’d say. I haven’t counted up page numbers because I listened to so much on audio but I’m pretty happy with the amount of time I was able to participate considering what I had going on that day. 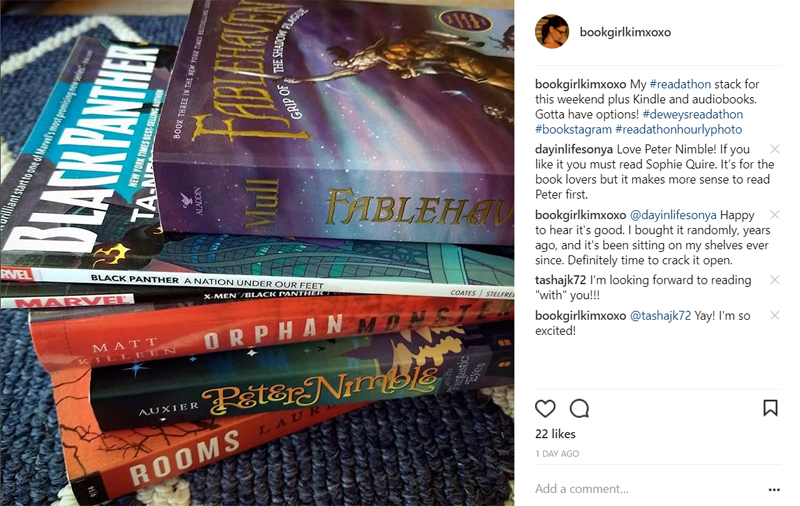 I absolutely adore the readathon community, especially for Dewey’s and I’m perfectly happy to participate for even just one hour if that’s all I can manage. Although I’d love to do more, I can recognize that I’m father ahead on my reading goals than I would have been otherwise, so even just a little is worth it. The next readathon will be October 20 and I’m really looking forward to it! Have you participated in a readathon before? Did you enjoy it? I loved this! I’ve never participated because I am always busy on readathon day but this gives some practical tips for how to participate even with a busy/scheduled day. Thanks! I really didn’t think I would be about to do it this year but I thought I could at least get in a few minutes here and there.